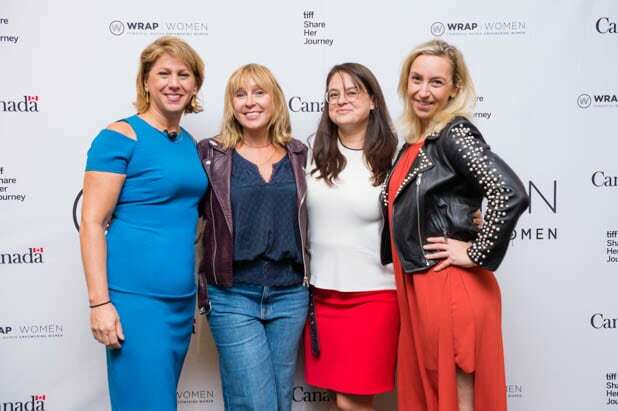 TheWrap founder Sharon Waxman, CherryPicks founder Miranda Bailey, Wattpad Studios Deputy General Manager Ashleigh Gardner and #MovetheDial founder & CEO Jodi Kovitz at the Power Women Luncheon Toronto. 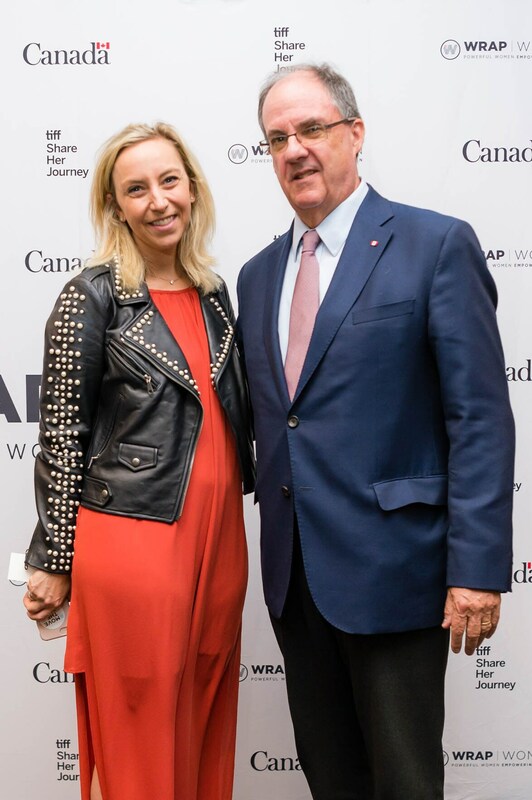 #MovetheDial founder & CEO Jodi Kovitz and Consul General of Canada in Los Angeles James Villeneuve at the Power Women Luncheon Toronto. "Free Solo" co-director Chai Vasarhelyi checking in to the Power Women Luncheon Toronto. Guests checking in at the Power Women Luncheon Toronto. Guests enjoying lunch at the Power Women Luncheon Toronto. TheWrap founder Sharon Waxman opens up the Power Women Luncheon Toronto. TheWrap founder Sharon Waxman introduces the Power Women Luncheon Toronto. Consul General of Canada in Los Angeles James Villeneuve gives opening remarks at the Power Women Luncheon Toronto. Consul General of Canada in Los Angeles James Villeneuve speaks at the Power Women Luncheon Toronto. Guests at the Power Women Luncheon Toronto. Guests enjoy lunch at the Power Women Luncheon Toronto. Toronto Film Festival VP of Advancement Maxine Bailey and filmmaker Molly McGlynn speak at the Power Women Luncheon Toronto. Maxine Bailey and Molly McGlynn speak at the Power Women Luncheon Toronto. Maxine Bailey speaks at the Power Women Luncheon Toronto. A guest documents Maxine Bailey and Molly McGlynn at the Power Women Luncheon Toronto. A guest at the Power Women Luncheon Toronto. TheWrap founder Sharon Waxman introduces the "Women in Tech" panel at the Power Women Luncheon Toronto. TheWrap founder Sharon Waxman, Wattpad Studios deputy general manager of Ashleigh Gardner, CherryPicks founder Miranda Bailey and #MovetheDial founder & CEO Jodi Kovitz at the Power Women Luncheon Toronto. Wattpad Studios deputy general manager Ashleigh Gardner speaks at the Power Women Luncheon Toronto. CherryPicks founder Miranda Bailey speaks at the Power Women Luncheon Toronto. #MovetheDial founder & CEO Jodi Kovitz speaks at the Power Women Luncheon Toronto. Ashleigh Gardner, Miranda Bailey, and Jodi Kovitz at the Power Women Luncheon Toronto. Ashleigh Gardner speaks at the Power Women Luncheon Toronto. Jodi Kovitz at the Power Women Luncheon Toronto. TheWrap founder Sharon Waxman, Wattpad Studios deputy general manager Ashleigh Gardner, CherryPicks founder Miranda Bailey and #MovetheDial founder & CEO Jodi Kovitz at the Power Women Luncheon Toronto. Jodi Kovitz speaks at the Power Women Luncheon Toronto. An attendee at the Power Women Luncheon Toronto. TheWrap film writer Matt Donnelly watches the Power Women Luncheon Toronto. 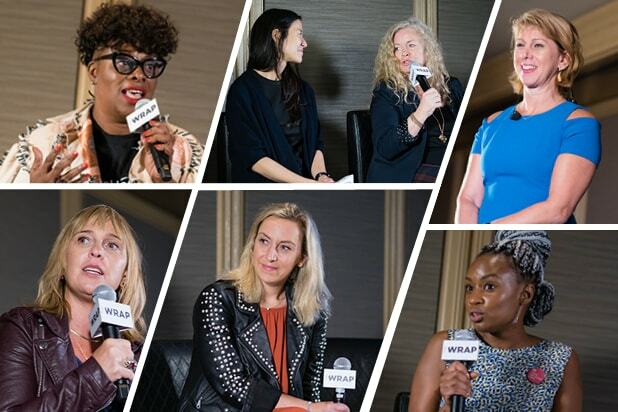 TheWrap founder Sharon Waxman, "Free Solo" co-director Chai Vasarhelyi, "Mouthpiece" co-writer/director & producer Patricia Rozema, "Rafiki" director Wanuri Kahiu, and "Capernaum" director Nadine Labaki at the Power Women Luncheon Toronto. TheWrap founder Sharon Waxman and "Free Solo" co-director Chai Vasarhelyi at the Power Women Luncheon Toronto. TheWrap founder Sharon Waxman with "Telling Our Stories" panelists at the Power Women Luncheon Toronto. "Rafiki" director Wanuri Kahiu speaks at the Power Women Luncheon Toronto. TheWrap founder Sharon Waxman, "Free Solo" co-director Chai Vasarhelyi, "Mouthpiece" co-writer/director & producer Patricia Rozema, and "Rafiki" director Wanuri Kahiu at the Power Women Luncheon Toronto. Patricia Rozema listens to "Rafiki" director Wanuri Kahiu at the Power Women Luncheon Toronto. Chai Vasarhelyi speaks at the Power Women Luncheon Toronto. Wanuri Kahiu speaks at the Power Women Luncheon Toronto. "Capernaum" director Nadine Labaki speaks at the Power Women Luncheon Toronto. "Mouthpiece" co-writer/director & producer Patricia Rozema speaks at the Power Women Luncheon Toronto. CherryPicks founder Miranda Bailey with a guest at the Power Women Luncheon Toronto. All proceeds donated from guests are directed to TIFF’s Share Her Journey campaign -- empowering women in front and behind the screen. TheWrap founder Sharon Waxman with guests at the Power Women Luncheon Toronto. "Mouthpiece" co-writer/director & producer Patricia Rozema with guests at the Power Women Luncheon Toronto. "Free Solo" co-director Chai Vasarhelyi, "Rafiki" director Wanuri Kahiu and TheWrap founder Sharon Waxman at the Power Women Luncheon Toronto. "Mouthpiece" co-writer/director & producer Patricia Rozema with a guest at the Power Women Luncheon Toronto. "Capernaum" director Nadine Labaki shares a hug with TheWrap founder Sharon Waxman at the Power Women Luncheon Toronto.